Musical visionary Bill Monroe, who got his start alongside brothers Charlie and Birch in the depths of the great depression, and subsequently performed as a solo act and bandleader for over sixty years until his death in 1996, was not just the father of the music we call bluegrass; he was its most prolific writer and disseminator. As composer and arranger, he created or recreated hundreds of songs; as progenitor, he found, groomed, and composed and performed alongside 161 Blue Grass Boys in a half century before sending them back out into the world to spread the gospel. According to interviews with the living members of that vast group, like an Old Master, his was the inspiration and vision, and – more often than not – the copyright went to him like a signature’s flourish. Between 200 and 250 songs, most written in those heady formative years before the folk revival truly took off, are attributable to him in whole or in part. And much as Dylan would later combine original craftsmanship with songs scavenged from the traditional folk songbook, Monroe’s work as an adapter of song reintroduced dozens of titles into the popular canon, giving these newly transformed tunes life through recordings and a ceaseless life of touring and performance. But whether they were Bill’s songs to begin with or merely bore his mark is not the point. Monroe served as a sort of lynchpin or nexus of protomusicology, pulling traditional fiddle tunes, back porch country, fieldhand and jump blues, the gospel hymnal, and old A.P. Carter folksongs into one broad, consistent genre, and then pouring hundreds of originals into the mix to stabilize it. In the process, through careful development of both a style and a form, with well-defined instrumentation and performance standards, and the consistent perspective of the God-fearing working man, he created bluegrass, the genre he came to define. And as a vocalist and harmonizer, an innovative mandolin player, and a powerful, influential bandleader, he also laid the groundwork for rock-and-roll with his introduction of staccato rhythms and bass under fast melodic chorus-and-verse – an influence acknowledged in his posthumous induction into the Rock and Roll Hall of Fame in 1997. So if we were to find a few songs of his beyond the bluegrass genre pool, it would not be such a surprise. After all, Elvis made his mark on Blue Moon of Kentucky as the b-side to his very first Sun records single. And even as it was the folk revivalists who sustained Monroe’s career during the sixties, arguably, it was that beat which Monroe brought to the music which ultimately found its way into Elvis’ hips – and to the roots and folk revivalists from there. That said: though both are essentially different, folk and bluegrass have their overlap. Taking on the songs of Bill Monroe without hitting the core of bluegrass itself is somewhat of a fake-out – bluegrass itself is a hybridized genre at heart; contemporary folk artists of all stripes like a good turn to the grassy side, and often have the banjos in their arsenal to prove it. And, as we’ve noted above, the tendency towards song reclamation which Monroe undertook has a tendency to muddy the waters of authorship. We’ll see some songs previously marked as traditional here, as seen in a number of Monroe tributes which mix traditional country and appalachian songs with those which bear his name, from Ricky Skaggs and Friends’ Big Mon (2000), which features Bruce Hornsby taking lead on Darlin’ Corey on a piano-jazz opening track, to Del McCoury’s fine 2011 tribute Old Memories: The Songs of Bill Monroe, which pretends only to play off of Del’s own memory of the man and the songs he came to own. Musically, too, we could go broad here, and none would fault us. But Monroe’s legacy is vast indeed, and any folkstream movement which would have his songbook turn out past the boundaries of Bluegrass itself honors both the man himself and his formative influence on music beyond genre definition. So although it was tempting to sneak in a Sam Bush cover below, we’ll stick to a reasonable attempt at a narrow focus that is consistent with our core mission here at Cover Lay Down: a set of bands and solo musicians who self-identify primarily as folk or roots artists, rather than bluegrass artists, playing some of the songs which bear Monroe’s name as composer in the annals of BMI copyright. From Ry Cooder‘s raucous roots and The Clumsy Lovers‘ high-energy cajunized folk rock to David Schnaufer‘s delicate dulcimer instrumentals; from June Bugg‘s early folk revivalism to The Wayfaring Strangers‘ acoustic lounge jazz take on Hank Williams co-write I’m Blue, I’m Lonesome; from the lo-fi indiefolk of The Diamond Family Archive to genre-crossing banjo, string, and guitar-driven takes from Cover Lay Down favorites Red Molly, Crooked Still, and the Jones Street Boys, the appalachian string music of Darol Anger, and the old-timey fiddlework of Mark O’Connor and Sadie Compton, this is Bill Monroe like you’ve never heard him before. 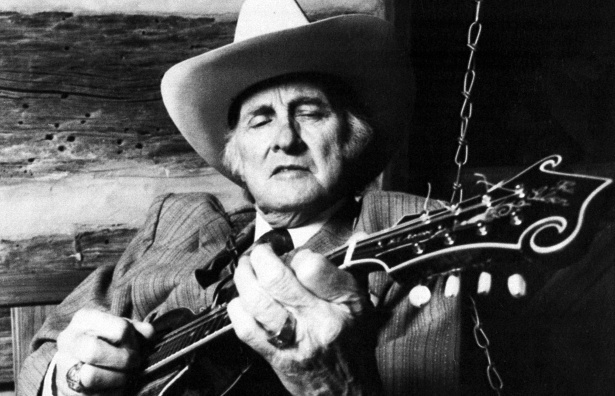 But the evidence is clear, regardless: Bill Monroe’s influence on the modern map of popular music is rivaled by none, and matched by few, indeed. Remember, folks: Cover Lay Down is ad-free and reader-supported in order to encourage all who visit to pursue the path of art patronage first and foremost, that the folkways may continue to flourish in our generation and beyond. Looking to follow the threads back to the source? Click on artist names above!